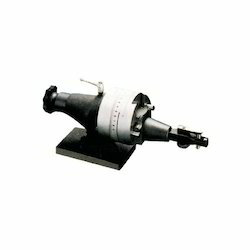 Designed for use on all grinding machines. Base angle-plate is heavy, precision ground and square on all six sides. Side block pivots on hardened shoulder screws. We are offering Handy Type Tangi Matic Dresser. Bestowed with the vast knowledge of the domain, we are able to offer our clients a wide range of Angle Dressing Attachment. Max. wheel diameter, standard : 11"
Tangent travel in either direction : 1.950"
Concave Radius with standard diamonds : 0-2-1/4"
Concave Radius with rat-tail diamonds : 0-2-1/4"
We are offering top quality range of Radius And Angle Dresser. These products are easy to handle and offer the buyers with best performance. Offered varieties are of optimum quality checked on global quality standards. Tested by quality examiners to ensure quality products are delivered at respected patrons’ premise. High Grade Cast iron base & body, Spring loaded, Angular accuracy ± 10seconds.. So as to win the fanatical interest and zealous veneration of our customers in all of our ventures, we have been offering a first class range of Angle Dresser.